This beautiful giant 3 foot Balloon comes with a handmade circle tail in a gorgeous mermaid colours with gold glitter accents. A gorgeous giant balloon ready to be inflated by you for a party, wedding or any special occasion! 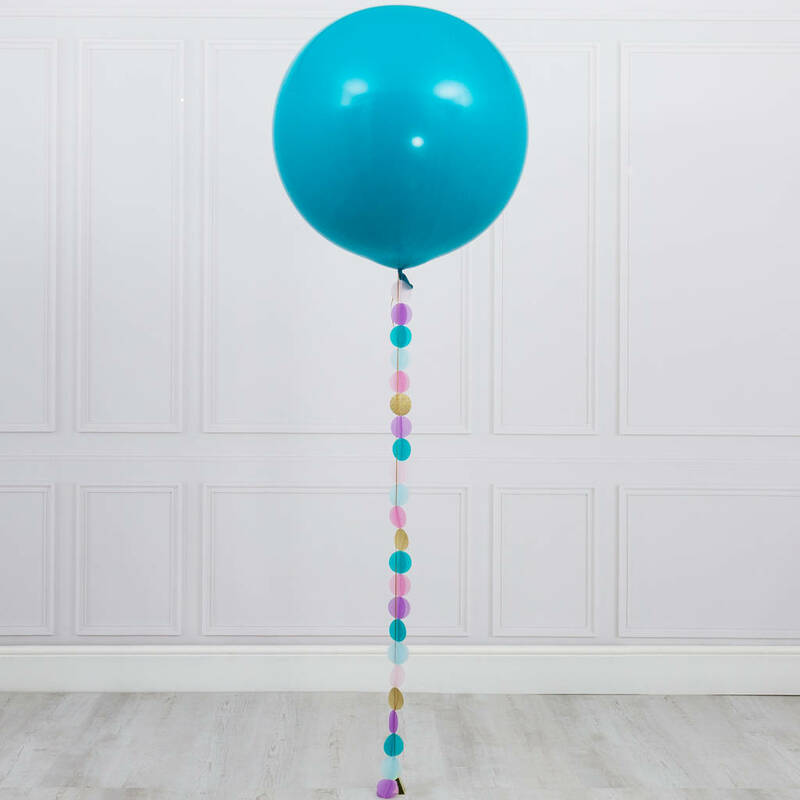 The balloon is supplied with a handmade circle tail that is simply stunning. Sure to add the 'WOW' factor to any occasion. Each balloon is sent out with securing clips and tying ribbon. Please note the delivery time for the giant balloons is 3 - 5 working days and the balloon is sent flat ready to be filled with helium by you. Co-ordinating items are available including a bubble confetti filled balloon, a large balloon with a tassel tail and a garland. Each of these canisters will fill 2, 3-foot Balloons to 70cm each. For the large balloons on the day our recommendation would be to have a tape measure, get 2 chairs and measure a space of 70cms between the 2 chairs, blow the balloon up with the helium in between the 2 chairs until it is touching each chair and then you will know it is filled to exactly the right size to hold the tail. Please note: if you have purchased a metallic balloon do not inflate them more than 70cm's. They are smaller in size than the standard giant balloons. The balloon is 70cm's when blown up and the tassel tail is approximately 2m in length.